A “Cult” building is a building, raised specifically for worship and various religious ceremonies. 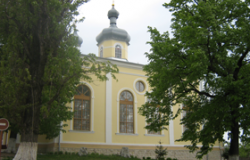 In Moldova, there are many types of religious buildings used for Christian churches and temples, monasteries, mosques and prayer houses. October 24, 2010 Christians were able to enjoy a long-awaited event - the consecration of the House of Prayer in the.. The great and outstanding architect who has worked for 22 years as chief architect of Chisinau, built not only rare..
Sculptural portrait of Hristo Botev in bronze stele, with head held high above and with waving banners behind, is set..
Old Orhei is a historical and archaeological complex. It is located 60 km to the northeast of our capital on the river..